Matching Wedding Invitations HERE | I highly recommend the LINEN or FELT paper type. 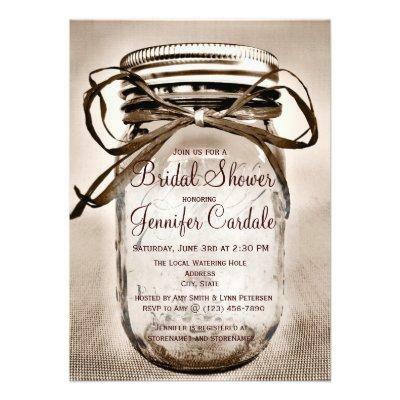 | Here&#;s a unique bridal shower invitation for a country bride. These feature a rustic mason jar in tinted sepia for a rustic look. The mason jar has a bow tied around it. These are perfect for brides who will be having a country style wedding or will be using mason jars in their wedding decorations.